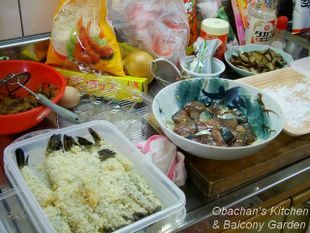 Now I’m back in my apartment with lots of photos and memories of the autumn festival in my hometown held last weekend. As soon as I entered the kitchen, I was led straight to the deep-frying pot. There waiting were breaded prawns and seasoned fish meat to be deep-fried. 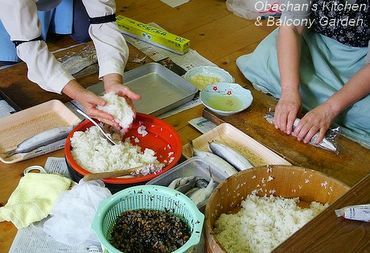 Rice was cooking in the electric rice cooker, and someone was filleting fish at an outside sink. 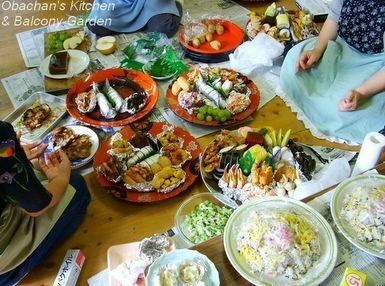 When you hear about elderly women cooking together for a community gathering, don’t you automatically expect them to be making “grandma’s signature dishes” with their expertise and all dishes to be wonderful? Oh well, that’s not necessarily always true. Sorry to disillusion you, but actually it was kind of hilarious. You know how it is to cook in a kitchen that you are not used to? To make things worse, everyone forgot to bring some ingredients/utensils and most of them were not available at the shop nearby. Participants of the festival enjoying the big feast. looks yummy! looking forward to your full write-up! I'm yearning to climb right through my monitor and join in the feast. It looks tooooo wonderful. Hi, I just ran into your blog while I was looking for Buri Daikon recipe. What a surprise! I'm from Kochi and now living in Connecticut, USA. Your blog is full of adorable pictures that takes me back to my sweet home town virtually! Hahaha. It must be really something to eat festival food with the kids with funny make-ups. Hi! So great to hear from you. I bet these Sawachi made you feel nostalgic, right? I visited Connecticut about 20 years ago and I still remember the taste of Lender’s bagels I had there. That looks so good! 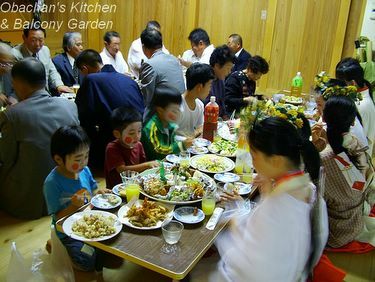 It's so nice to see the whole families cooking together... 3 or 4 generations under one roof?! It looks like fun! It sounds like everyone's nerves got a little frazzled, but I bet it made for a great time overall! I find that bonding experiences like those are increasingly hard to come by in our structured world. Any way, the food looks great! Did the cooks learn any special tricks from one another? Despite all the little problems, all the food looks great! It WAS a lot of work. Really. Hope the festival attendants enjoyed the food. Thank you. Maybe our festival food is a bit different from the popular festival food in Osaka? You are a Goddess to create this marvelous site. 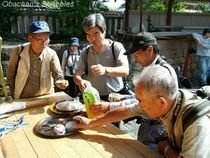 I just got back from two glorious weeks in Japan and I found your site when looking for a recipe. The photos are wonderful and your writing is divine. thank you! Thank you so much for the compliment :) I'm so happy to hear that you enjoyed your stay in Japan. Comve visit my site whenever you miss Japan!